Feng Ling’s raving words made Jiang WanLi’s brows knit. He had no idea why Liu TianRen’s words didn’t work anymore. What Jiang Mu had said caused a lot of voices in favor of his words. Jiang people were now eager for fighting against Feng village. For people living in Mang Mountains, fighting was a normal thing as they had to fight against all kinds of fierce beasts all year round to survive. This could also be known from Jiang Yun’s battle-scarred body. Though he was only sixteen years old, it was no exaggeration to say that he was a guy of rich experiences. Hence, people in Mang Mountains would always fight without fear. “Shut up!” The war between the two villages was on the verge of breaking out, while a sudden shout interrupted those voices. Everyone looked for the sound and found that it was Jiang Yun who had pushed himself through the crowd and stood in the front of Jiang people. Jiang Yun was in extreme anger, with eyes exposing a fierce light. Just as Jiang people regarded him as one of the big family, he also regarded them as relatives. Jiang village was his home. As a result, he would never bear Feng people who made verbal attacks to his family. Moreover, all of such things happened because of him. A ten-year-old boy was too young. At that time, Jiang Yun could only hide behind his grandpa and live under grandpa’s protection. But now he was already sixteen. He was going to be an adult according to Mang Mountain’s custom. Jiang Yun’s appearance made Feng Ling’s eyes bright immediately. However, before he spoke, a screeching noise flew across the sky abruptly. A sharp blade which was formed by a fierce wind appeared as if out of nowhere. It was shot towards Jiang Yun at an extreme speed without any sign. It was one of the Tao magic arts! Watching this Wind Blade Jiang Yun was kind of envy, though it wasn’t a right time as he was facing a sneak attack. Because only cultivators could cast Tao magic arts. A cold light flashed through Jiang Yun’s eyes. He was about to take down this attack, while Jiang Mu standing beside him acted much more quickly. Jiang Mu pounded on that Wind Blade with his fist. 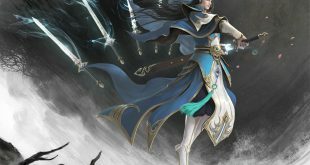 Though Jiang Yun couldn’t do cultivation, he knew clearly that the first three realms from lower to higher were Meridians Unclogged Realm, Blessing Land Realm, and Sky Reaching Realm. And each realm included nine levels. It looked like the Meridians Unclogged Realm was the lowest realm. But once you were in the Meridians Unclogged Realm, it meant that you were on the way to cultivation. And a cultivator should never be underestimated. Jiang Yun even knew that the most powerful one among Jiang people under thirty was only in the fourth level of Meridians Unclogged Realm. While the guy called Feng WuJi was just around eighteen or nineteen, but he was already in the fifth level of Meridians Unclogged Realm. He really had a talent for cultivation. However, precisely seeing from this point, his sneaky action was particularly disreputable. Such a conversation enraged Jiang people again. Feng WuJi not only sneaked up on Jiang Yun, but even regarded Jiang Yun as prey. How could Jiang people bear it! “Alright! Then today I will break my rule. Feng WuJi, your death will be swift! You are my prey now!” Jiang Mu then said. Feng Ling’s threat made it clear why Feng people dared to come. Jiang people was burning with rage due to Feng Ling’s words. They could never stand either hand Jiang Yun in or submit themselves to Feng village. Suddenly, another screeching noise flew across the sky. Something black was shot into the ground in the front of Feng WuJi by Jiang Yun in a flash. Following his last word, everyone was in silence. All their eyes were concentrated on that black arrow. That arrow represented a letter of challenge. A letter of challenge from Jiang Yun to Feng WuJi. And Feng WuJi would pull that arrow only if he took up the gauntlet. This was a rule in Mang Mountains. If two villages were going to have conflicts, most of the time they would challenge each other to a duel to avoid large-scale bloodshed. Each one in this duel, no matter the one challenged or being challenged, represented their own clan. Hence, in general, the one who challenged to a duel would find a rival equally close to him to have a high possibility of triumph. As a result, the fact that Jiang Yun challenged Feng WuJi was beyond everyone’s expectation. Jiang Yun couldn’t cultivate. He’s only a mortal, though his physical fitness was not bad and he had gone into the deep Mang Mountains several times. While Feng WuJi was a cultivator in the fifth level of Meridians Unclogged Realm. Jiang Yun’s action was, in others’ opinion, like an infant who tried in vain to challenge a strong adult. It was totally a suicide mission. A youth a little higher than Jiang Yun stood front in a hurry. He was called Jiang Lei, a guy in the fourth level of Meridians Unclogged Realm and meantime the strongest among the youth of Jiang village. “Alright!” Feng WuJi beckoned to that arrow abruptly, and a whirlwind pulled it out and sent it into his hand. Feng WuJi accepted the challenge.